Unusual German map illustrating the outbreak of the American Revolutionary War to a French Audience. An uncommon 1776 Mathais Albrecht Lotter map of the United States on the cusp of the American Revolutionary War. Focused on the 13 original British Colonies, this map covers from Florida to Newfoundland and t Hudson Bay, and extends westward as far as Lake Michigan, including all five of the Great Lakes (only 1/2 of Lake Superior). Some offshore details are noted particularly the fishing banks off the coasts of North Carolina, Massachusetts, Nova Scotia, and Newfoundland. The map focuses on the 13 original colonies which are presented in considerable detail although, in some cases, with curious borders. Of note are the unusual boundaries given to Maryland and Maine. Pennsylvania has been granted the fully all of what is today western New York as north far as the Finger Lakes - which is identified as Iroquois territory. Vermont has yet to manifest. Lotter, a German cartographer based in Augsburg, no doubt intended this map to capitalize on popular French interest in the American Revolution. The elaborate title text is composed entirely in French - unusual for Lotter - and the geographical deportment of the colonies themselves betray a distinctly Franco-centric perspective. Despite the French loss of their North American territories in 1863, at the end of the French and Indian War, they must have maintained certain prejudices regarding the limits of British claims. Such is reflected in the French pre-French and Indian War convention, exemplified here, of restricting the 13 colonies to those lands east of the Appalachian Mountains. Curiously the only exception to this convention on Lotter's map is the presentation, in reference to North Caronia and Virginia, of secondary boundaries extending westward beyond the scope of the map in accordance with the original Royal charters of these two colonies. This is a convention we have seen before, although the intent of the cartographer here, as elsewhere, is unclear. Perhaps, in the name of scientific impartiality, Lotter is attempting to represent both French and British perspectives? West of the Appalachian Mountains the map offers uncommon detail in the Ohio Valley, including various American Indian settlements and forts related to the events of the French and Indian War. These include Fort de Necessite, Logs Town, Twictwees, Ft. Du Quesne, Allegheny, Vinango, Buffaloons, Sandoski and Mingos. An exceptionally large and elaborate title cartouche dramatically fills the lower right quadrant. 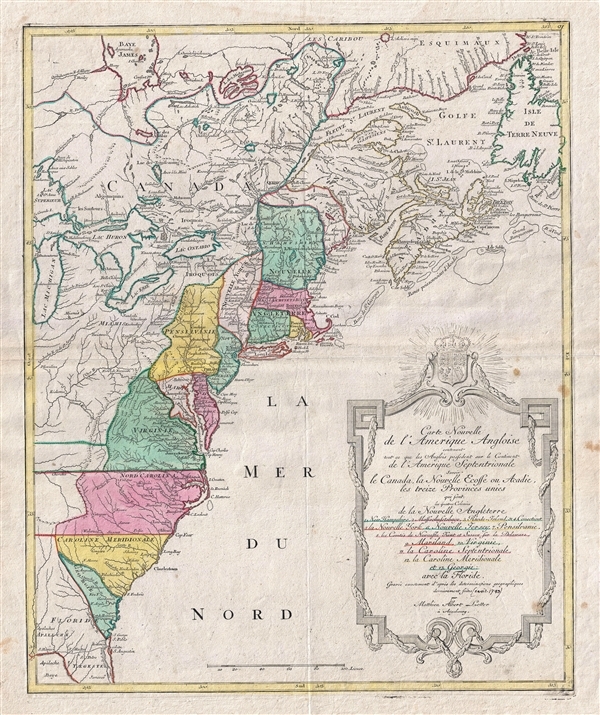 The text, as previously mentioned, in in French and details the content of the Map, including an individual naming of the original 13 colonies (and Florida). The title text is bordered by an elaborate frame of a rococo ethic surmounted by Royal armorial crest of the United Kingdom. This map was published in Suetter's 1783 Grosser Atlas as well as independently. Tobias Conrad Lotter (1717 - 1777) was a German engraver and map publisher. Letter was the son of a baker and city guardsman, but married Euphrosina (1709-1784) Seutter, elder daughter of the prominent map publisher Matthäus Seutter. He began working at his is father-in-law's map business about 1740. Between 1740 and 1744 he produced, under Seutter's imprint, the Atlas minor, Praecipua orbis terrarum imperia, regna et provincias, Germania potissimum tabelli. Upon Seutter's death, in 1757, the firm's stock was taken over by his son, Albrecht Karl Seutter (1722-1762), who himself died in 1762, just a few years later. The remaining Suetter map plates were subsequently divided between Lotter and the publisher Johan Mitchell Probst (1727 - 1776). With the support of his sons, Matthäus Albrecht (1741-1810), Georg Friedrich (1744-1801) and Gustav Conrad (1746-1776), Tobias Conrad Lotter succeeded in building on the economic success and professional reputation of his father-in-law. In time, Lotter became one of the most prominent mid-18th century map publishers working in the German school. After Lotter's death in 1777, the business was taken over by his two eldest sons, who, lacking their father's business acumen, presided over the firm's slow decline. It was nonetheless passed on to a subsequent generation of Lotters, Matthäus Albrecht Lotter's sons, Gabriel (1776-1857) and Georg Friedrich (1787-1864), who pushed it into further decline until it faded out in the early-19th century. Lotter, M. A. and Seutter, G. M. Grosser Atlas, (Augsburg) 1783. Very good. Original fold marks Platemark visible. Blank on verso. Old Color. A mansucript date of 1783 has been added to the title cartouche - we are undertain what this is referring to but it may be the publication date of the atlas this was bound into. OCLC 706063843. McCorkle, B. B, New England in Early Printed Maps 1513 - 1800, 776.19. Phillips (America) 3517. Sellers, John R. and Van Ee, Patricia, Maps and Charts of North America, 141.